Types of Iowa Car Accident Injuries | Hupy and Abraham, S.C. Car accidents are, unfortunately, everyday occurrences in Iowa. Some crashes are minor and people are able to walk away without significant physical injury. However, other crashes are devastating. 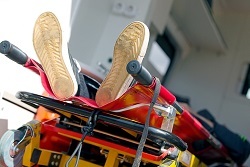 Here is an overview of some of the serious types of injuries that can occur after a car crash. Nerve damage, diffuse axonal injuries, or shearing or tearing of the white matter: The rapid change in speed during a car accident can cause the brain to move too quickly. This may result in the nerves being disrupted or the brain matter tearing. Lacerations: When the brain collides with the skull bone during a car accident, then the blood vessels or brain tissue can be cut and a serious brain laceration can result. Blood clots or hematomas: If a blood vessel ruptures during or after a car crash, then a dangerous blood clot or hematoma may occur. Hematomas are typically categorized according to where they occur in the brain. Concussions: A concussion may occur if a car accident victim hits his head during the collision or if the brain collides with the skull. Concussions can take a long time to heal and may be serious—particularly if the injured person has had a prior concussion. Some people recover from brain injuries after car crashes, but for others the results can be long-term, permanent, or fatal. Spinal cord injuries are also life-changing. Spinal cord injuries are divided into two categories: incomplete spinal cord injuries and complete spinal cord injuries. Anterior cord syndrome: Anterior cord syndrome occurs when the front of the spinal cord is injured. People who suffer this type of incomplete spinal cord injury in a car accident may experience impaired sensations such as pain and touch below the part of the spinal cord that was hurt in the crash. Central cord syndrome: Central cord syndrome occurs when the middle of the spinal cord is injured. People who suffer this type of incomplete spinal cord injury may experience some loss of function in their arms. Posterior cord syndrome: Posterior cord syndrome occurs when the back of the spinal cord is injured. Impaired coordination is a common issue for people who suffer this type of incomplete spinal cord injury. Brown-Sequard syndrome: Brown-Sequard syndrome occurs when only one side of the spinal cord is injured. People who suffer this type of incomplete spinal cord injury may retain sensation on one side of the body, but not the other, and may retain the ability to move on one side of the body, but not the other. Cauda Equina lesion: A cauda equina lesion occurs when the nerves between the first and second lumbar regions of the spine are injured. Car accident victims who experience this type of incomplete spinal cord injury may experience full or partial loss of sensation. Complete Paraplegia: Paraplegia occurs when there is an injury at or below the T1 point on the spinal cord. People who suffer this type of complete spinal cord injury do not have sensory or nerve impulses below the point of injury. Their legs and trunk are typically impaired, but they may retain use of their arms and hands. Complete Tetraplegia: Tetraplegia occurs when there is an injury high up in the spinal cord such as in the neck region. Everything below the point of the injury is impaired. Thus, a person who suffers this type of complete spinal cord injury may not be able to use his legs, trunk or arms. Breathing may be impacted and a ventilator may be necessary. Regardless of whether you suffered a complete or an incomplete spinal cord injury, you have suffered a serious injury and you need to find out more about protecting your recovery. Broken bones: Broken hips, legs, arms, and other bones may be serious and may require extensive medical attention. Burns: If a fire occurs during a collision, then serious burns can result. Severe burns are painful and often require surgery and hospitalization. Infections and disfigurement are significant risks after car accident burn injuries. Amputations: An amputation may occur if a limb is severed at the accident scene or if a doctor later determines that the injury, or resulting infection, is so severe that an amputation is warranted. Pregnancy complications: The impact of a car crash can cause dangerous complications for both a mother-to-be and an unborn child. Some of these injuries may not result in immediate symptoms so prompt medical attention is important. Of course, the most significant injury that can be caused by a car crash is death. A wrongful death may occur because of one of the injuries described above or for another reasons. Whether you have lost a loved one or you have been injured in a car crash, you deserve to get help with your recovery. You have already suffered enough because of another driver’s negligence. Please start a live chat with our experienced car accident lawyers today to find out more about protecting your rights and your possible legal recovery.